Why so serious? Because the end of Gotham is right around the corner and we are NOT ready! 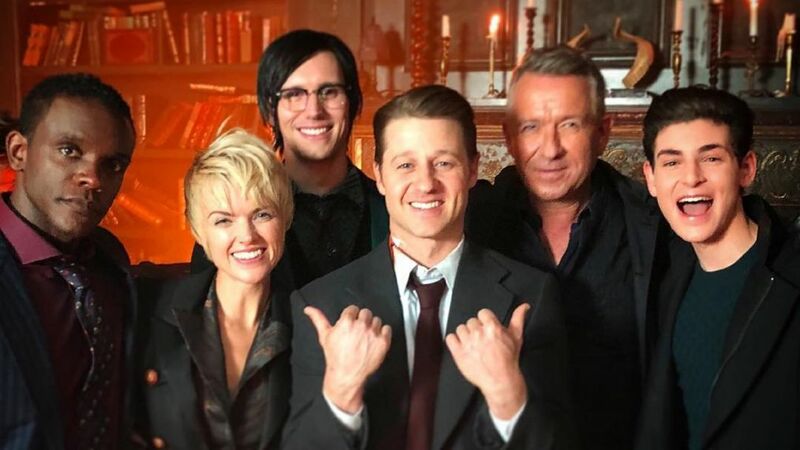 Ben McKenzie, David Mazouz, and more of the cast and crew bid farewell from set. So, this is the Joker, right?! "I am imposing my own embargo," laughs Cameron Monaghan, whose Jeremiah debuts his ultimate evolution in the April 25 ender, following a fateful swan dive into a pool of fluorescent glue at the Ace Chemicals plant several episodes back. "They don't make us sign non-disclosure agreements but they should have!" What Monaghan will say is "that we see a natural crystallization of everything that we have created over the course of five years," which has seen the Shameless actor play both Jeremiah Valeska and his late twin brother, Jerome. "With Jeremiah, we have a lot of vanity. But with Jerome, we had monstrosity. So what happens when we combine vanity with monstrosity? What do you when it's horrifying but they still perceive themselves as something else?" Check out his "so pretty" teaser below. And even though this 'J' fellow mixes "a lot of what we have done before," Monaghan promises that "there's a lot new," too. In addition to "looking like nothing we have seen before," he also goes on to note that the show — which has previously borrowed heavily from the Clown Prince of Crime's backstory — has a new twist to the canon up its sleeve. "There are multiple shout-outs to different aspects of the origin and then we're doing some unique stuff with it as well. "I think what is really interesting about this is, no matter how outlandish we have gone with the twin and all of that stuff... we kind of go a little bit more grounded with him at the end, which I like," he previews. "There is something pretty human and horrifying about this guy." Villains. Sometimes we hate them, sometimes we love them, and sometimes... we hate how much we end up loving them. As for J's final look and feel, Monaghan admits that "we were allowed a lot more leniency than we were ever allowed before. A lot of that is thanks to the fans wanting it and also to us for fighting the good fight." And of course, he finished with a laugh. "We're in the final season of the show, so we could go 'Screw it...what are you gonna do, cancel us?'"